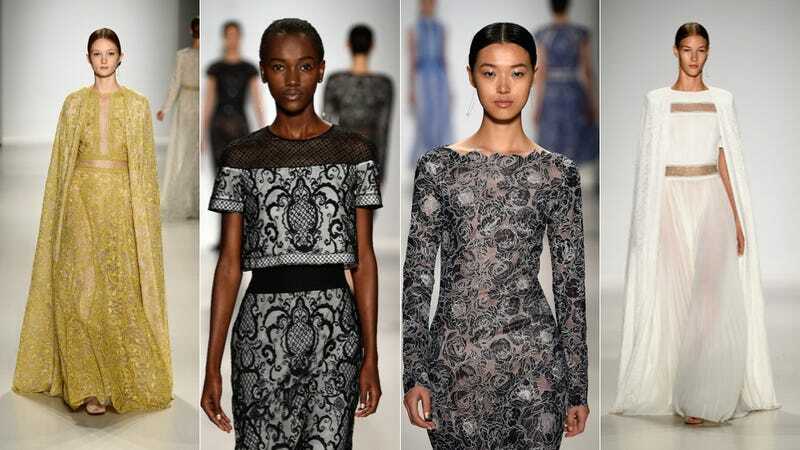 New York Fashion Week marches on: on Thursday, Tadashi Shoji showed his stunning and sumptuous spring 2015 ready-to-wear collection. According to the show notes, Shoji drew his inspiration from 15th-century Venice; the collection is meant to recall the Grand Canal at sunset, shimmering with the reflection of the Ca' d'Oro. Accordingly: lots of dresses in shimmery gold and blue and rose; a vast amount of opulent lace; dramatic and regal silhouettes (i.e., FORMAL CAPES, the best trend in existence).